The Golden Mountain Toad, also called the Monteverde Golden Toad lived in a single, high altitude tropical forest near Monteverde, Costa Rica. 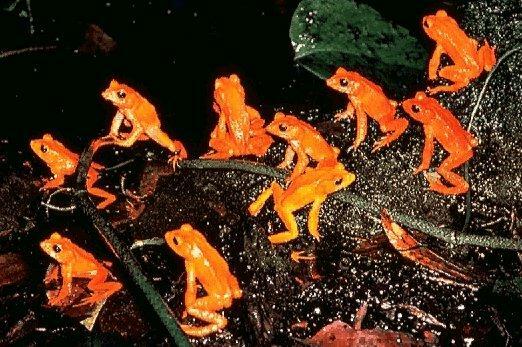 These forests were often enveloped by clouds, a climatic condition that the toads had adapted to. Global warming has created more drought conditions, leading to changes in climate that the toad was not adapted to and leading to its demise. The last Golden Mountain Toad was documented in 1968, and the amphibian was declared officially extinct throughout the world in 2008 by the International Union for Conservation of Nature and Natural Resources (IUCN), the official organization for tracking endangered species. Climate change driven by human's emissions of greenhouse gases, along with other environmental abuses (chemicals, deforestation, mining, dams, etc.) are driving extinctions to their highest rate in 65 million years, potentially endangering more than 1 million species over the next few decades.